Uganda is gifted with close to a half of the world’s critically endangered mountain gorillas where by 400 thrive in Bwindi Impenetrable National Park while 12 thrive in the Mgahinga Gorilla National Park in the south western tip of Uganda forming a rich ground for gorilla trekking safaris and tours in Uganda. The Mgahinga Gorilla National Park is less popular in terms of gorilla trekking but those who have attempted to adventure into it have reaped considerably. 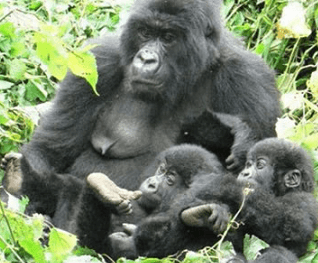 Perched in the three volcanic Mountains of Muhabura, Gahinga and Sabyinyo, Mgahinga has one habituated gorilla family named Nyakagyezi and thus can take a maximum of eight (8) travelers on gorilla safari in Uganda. The Uganda gorilla trekking safari experience in Mgahinga is coupled with Volcano climbing as gorillas forage in the raised landscapes of the Mountains giving the trekkers an opportunity to have magical encounters with the mountains and then with the gorillas themselves. The start for the trek depends on the location of gorillas in the park. When they are on the Sabyinyo side, the trek starts at Ntebeko Visitor Center but when they are on the Muhabura side then the trek commences on the side of Muhabura. The drive to Mgahinga Gorilla National Park is one of the extended drives that you can have in Uganda stretching to 519km about 10 hours’ drive from Kampala following a tarmac road up to Kisoro town 14km to Mgahinga. The transfer is very scenic especially the Kigezi Highlands and the section between Kabale and Kisoro is very rewarding to drive along. This contributes to the lasting memories for travelers on gorilla safaris in Uganda. Like Bwindi, gorilla trekking in Mgahinga requires a gorilla permit however its permits are issued at the park Headquarters in Kisoro not at Uganda Wildlife Head Quarter in Kampala. The trek also lasts between 2 – 8 hours and the direct encounter with mountain gorillas takes one complete hour.